Sad scary clown riding on unicycles in a dark street. 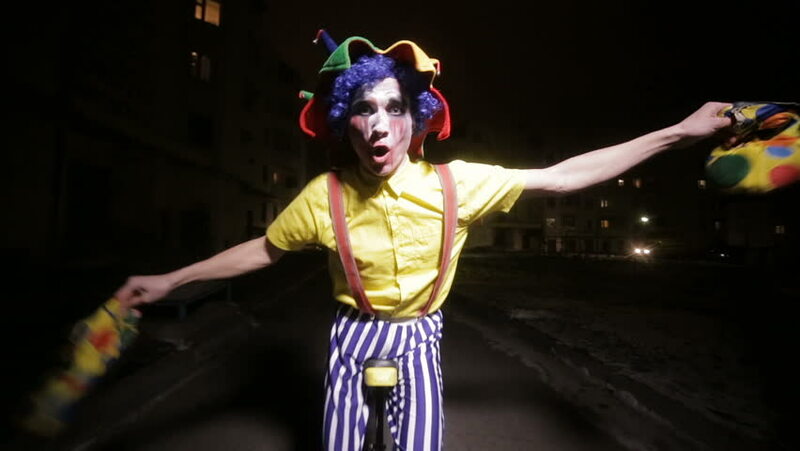 hd00:10Sad scary clown riding on unicycles in a dark street. 4k00:30An unidentified costumed dance company performs during transfer of powers of Aguilas Carnival. A party with international tourist interest. Aguilas, Spain February 18th, 2017.
hd00:10MOSCOW, RUSSIA - OCTOBER 30, 2015: Singer Tasha G performs on a stage during "RED TIE" National Award for corporate event management industry. Swissotel Red Hills. hd00:30FEIRA, PORTUGAL - MAY 24: Tresperté Circo from Spain during the Imaginarius event on May 24, 2013 in Feira, Portugal.